1 package Sugardale peppered Bacon. 1/3 cup blue cheese, crumbled + additional for topping (if desired). 1 1/2 cups thinly sliced Vidalia onion. 2 cups oil for frying. 1/4 cup chipotles in adobo sauce. 1. Fry bacon just until crisp. Drain on paper towels and set aside. 2. Mix together ground beef and blue cheese. Season with salt and pepper and form 8 mini burger patties. Cover with saran wrap and set aside, or place in refrigerator. 3. Heat oil in a medium saucepan until hot. Dredge sliced Vidalia onions in flour and fry until crispy. Drain on paper towels and set aside. 4. Mix mayonnaise and chipotles in a small bowl. Set aside. 5. Heat grill or skillet to medium heat. Cook burgers until they reach desired doneness. 6. 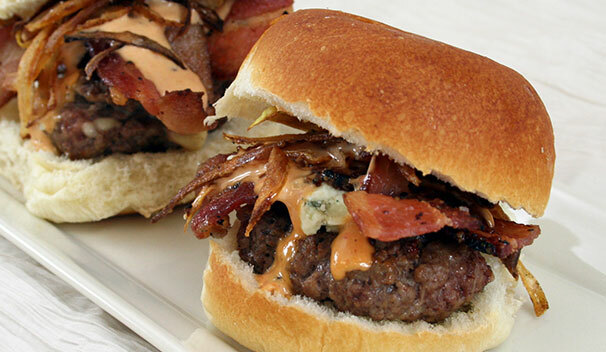 Top burgers with additional blue cheese, bacon strip, onion strings, and chipotle mayo. Serve immediately.